Close end rivets provide an extremely effective way to create watertight seals for a wide range of applications. The improved tensile strength and mandrel retention provide increased performance and better overall sealing capabilities compared to open-end rivets. Some of the common applications associated with closed end blind rivets include signs, electronic enclosures, scoreboards, LED displays and more. Contact us for more information regarding our numerous types of rivets including solid rivets, blind rivets, semi-tubular rivets and more. 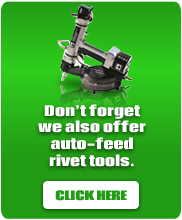 Or call us at 1-800-783-0910 with any questions that you may have. Blind, closed-end rivets are mainly used when access to the base material is available from only one side and the application requires a water-resistant seal. There are many applications where the back of the base material cannot be accessed, as in fastening to walls or tubes. In cases where the back or “blind” side of the material cannot be reached, it is not feasible to use sheet metal screws, nuts, and bolts. Even the use of solid rivets requires access to the rear of the base material. Blind break-stem (POP® style) rivets provide a very valuable function in these applications, with the added benefit of being extremely cost-effective. Cost is also a major reason why a manufacturer might choose to use a blind rivet in an application. The unit cost of a sealed blind rivet is often lower than the cost of other types of fasteners. The labor cost savings is equally impressive because they can be installed at an average rate of 15 rivets per minute. Try matching that speed with a nut/bolt installation! There are typically three governing factors that must be considered before making a material decision for your POP® rivet application needs. These considerations include strength, corrosion resistance and the material being fastened. Galvanic corrosion, also called “dissimilar metal corrosion” refers to corrosion damage induced when two dissimilar materials are coupled with a corrosive electrolyte (e.g. water). Certain materials should never be in direct contact with one another (like copper and aluminum) because a galvanic action will corrode the sacrificial metal at a faster rate than the other. Galvanic corrosion is the concern in applications that are high in moisture content, like air conditioning and marine applications. For more general information on Blind Rivets, see our Standard Open End, Multigrip, and High Strength/Structural product pages. Contact us for more information regarding our closed pop POP® style rivet, sealed blind rivets and tubular rivets today, or request a quote for an in-depth price analysis. 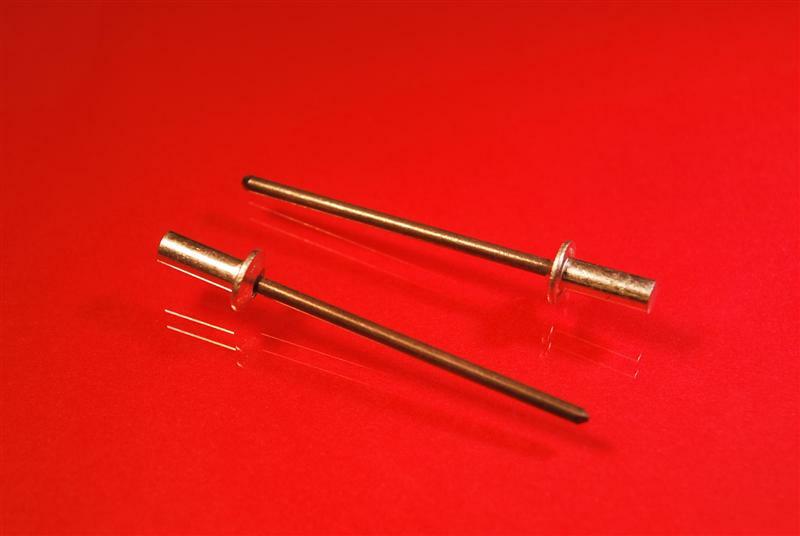 Cost is a major reason why a manufacturer might choose to use a blind rivet in an application. The unit cost of blind rivets is much lower than the cost of most other types of fasteners. The labor cost savings is equally impressive, because they can be installed at a rate of up to 15 rivets per minute. Try matching that speed with a nut/bolt installation! The typical governing factors in rivet material selection are strength, corrosion resistance and the material to be fastened. Galvanic corrosion, also called “dissimilar metal corrosion” refers to corrosion damage induced when two dissimilar materials are coupled in a corrosive electrolyte (e.g. water). Certain materials should never be in direct contact with one another (like copper and aluminum), because a galvanic action will corrode one metal at a faster rate than the other. Galvanic corrosion is of particular concern in applications that are high in moisture content, like air conditioning and marine applications. To assist in corrosion prevention, these rivets have a completely closed end to prevent the entry of liquids, moisture, air and other contaminants into the rivet or the riveted hole. Likewise, this rivet can be used to prevent the leakage of such materials from an assembly (e.g. fluid from a reservoir). JHP Fasteners also offers these Standard Closed End Blind Rivets in four material combinations: all aluminum, all steel, all stainless steel, and aluminum rivet with phosphated steel mandrel. Contact JHP Today… Contact us for more information on our standard closed-end rivets, we will work hard to win, and retain, your business!